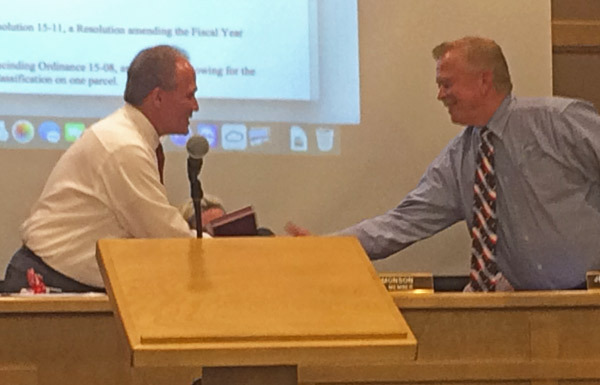 SMITHFIELD — In what Mayor Darrell Simmons referred to as a “historical night,” the City Council said goodbye this week to two members, Dennis Watkins and Brent Buttars, at its last official meeting of the year. Veteran Council members Watkins and Buttars both decided not to run for reelection in the 2015 election. Curtis Wall and Deon Hunsaker were elected to their seats and will become the two new City Council members at the first of the year. Watkins, who had spent eight years on the Council, said that he has always been very proud to serve and live in Smithfield. Watkins named his work on the new city office building and the additions to the library as some of his proudest achievements during his time in office. Brent Buttars, who served 12 years, said he has loved living in Smithfield all of his life and has been excited about its growth. Buttars said he is very proud of what the Council was able to accomplish during his three terms, but he is especially proud of the new additions to the library, which were completed last year. Councilmember Barbara Kent said she has been very honored to work with Buttars and Watkins on the council and is sad to see them leave. Simmons quoted Winston Churchill, saying that while in office, you can either be a caretaker or you can make a difference.